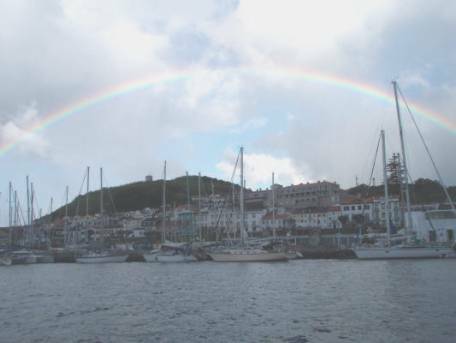 The voyage from Bermuda to the Azores was a difficult one (see previous log file), which made landfall at Horta on Faial so beautiful. Our last night a sea we could see lights on Faial; it looked as if the island had a lovely string of pearls with jewel clusters. We later discovered that the perimeter road has streetlights even outside of the towns (string of pearls), and that there are always lights in the towns (jewel clusters). We had strong winds from the west with intermittent rain showers throughout the night. 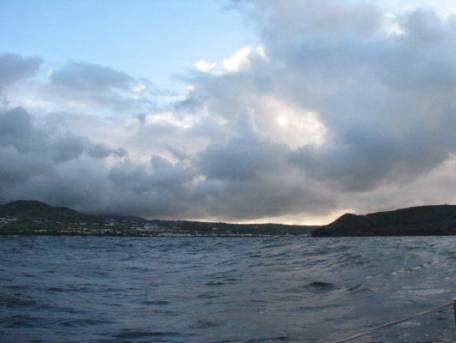 We were prepared to motor the last 12-24 hours, since there is usually a high-pressure system over the Azores in which the wind is light or calm. 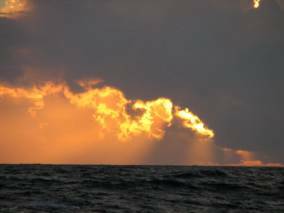 But, true to the pattern of our Bermuda to Azores leg, the weather was unpredictable and we carried our sails to within 2 miles of the harbour entrance. 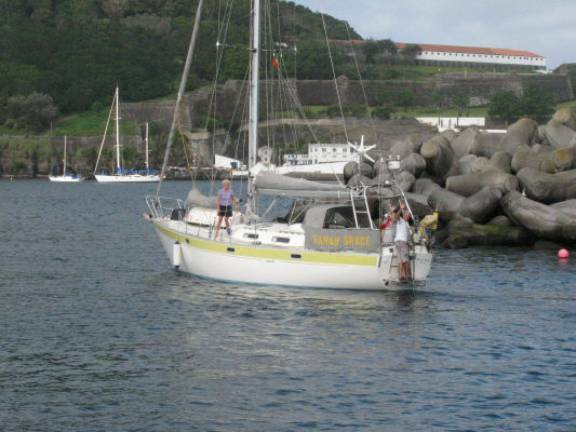 We spent two weeks in the Azores, visiting three of the nine islands and doing various boat repair/ maintenance tasks. (The last section of this log file provides some information on system failures and repairs … of interest to some of you). 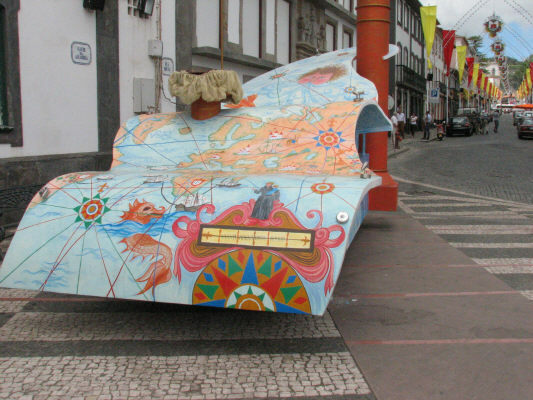 The Azores is a loose federation of nine major inhabited islands belonging to Portugal and about 750 miles off the Portuguese coast. They are near the margin of the Eurasian and African tectonic plates, and weaknesses in this part of the earth’s crust allowed molten lava to seep through to the surface and form volcanoes. 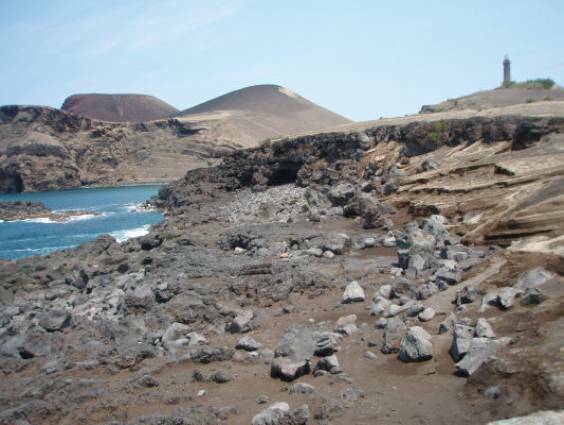 Most of the volcanic cones on the island have disintegrated forming vast craters or caldeira. 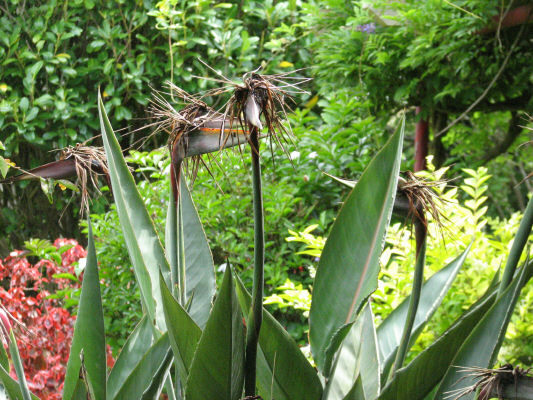 The volcanic soils become rich and fertile after a period of weathering, especially in the warm (tropical) moist climate. The agricultural economy has changed little over the last 500 years. European farmers, not only from Portugal and Spain, but also the Low Countries, settled the islands. Raising cattle, sheep and pigs is the mainstay, with crops of grains, fruit, tea, tobacco and vines. 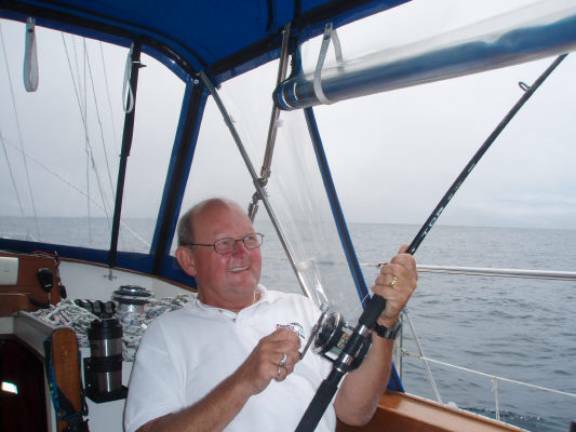 Fishing is a secondary industry, and tourism is becoming a source of employment and income. 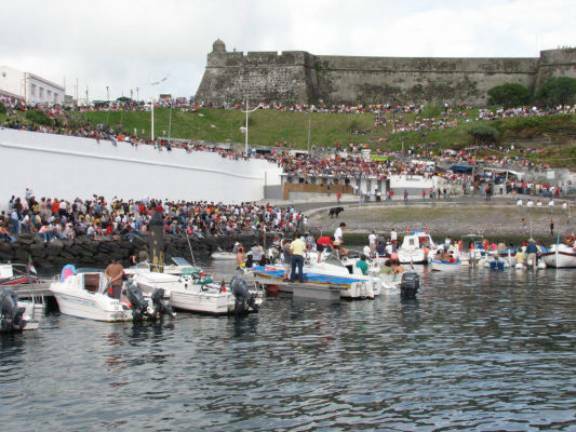 Whaling is now part of the history of the islands with its associated boat building industry. 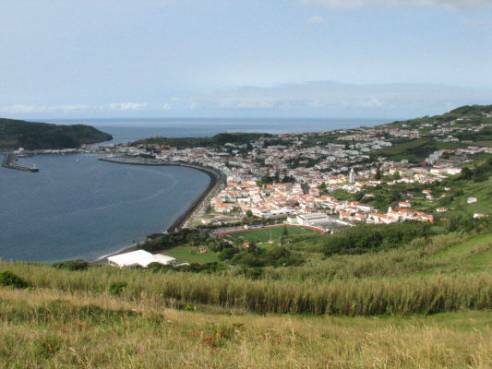 Faial: Horta is the largest town on the island Faial. 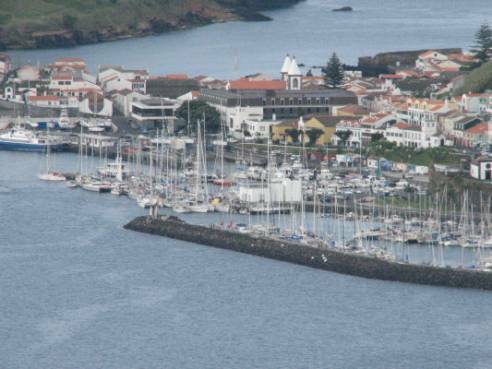 Because the harbour is the most protected of any in the Azores and there are a chandlery, hardware store, sail repair specialists, and marine mechanics; it is the most popular stopover for ocean passage yachts. After clearing customs and immigration, we were assigned a spot along the inside seawall. 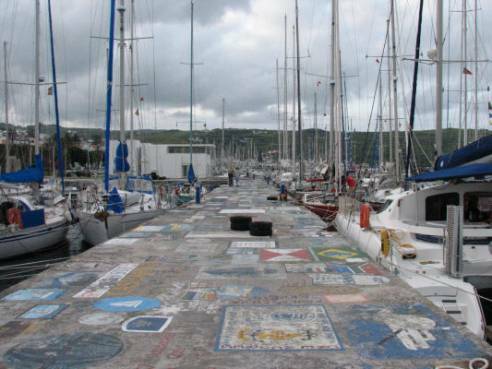 Boats were rafted 4-deep along the wall; the marina also had 3 pontoons that had finger docks for some of the boats. In Bermuda about half the boats were from outside North America. 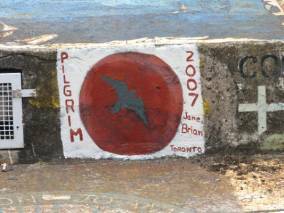 In Horta US and Canadian boats were definitely in the minority. The white and pastel stucco buildings with terra cotta tile roofs and cobblestone streets and sidewalks were further evidence we were in Europe. At the chandlery (marine store) one of the women sold eggs her hens laid that morning; what a treat to find eggs that were unwashed and not refrigerated (sometimes still warm from the laying hen). The yolks were golden and thick; Brian’s omelets, always a treat, were magnificent. 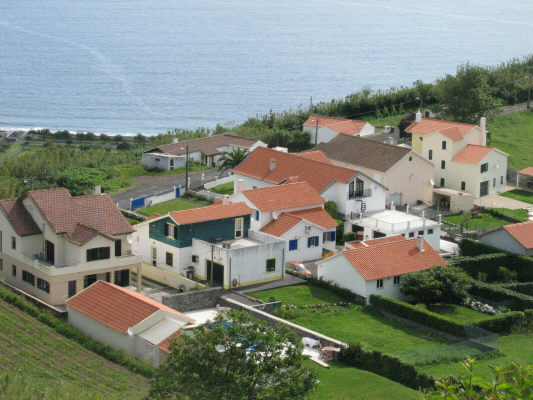 Modern residential community just outside Horta … Azores suburb ? Each of the islands is distinct in its geology, economy, ethnic background and culture. 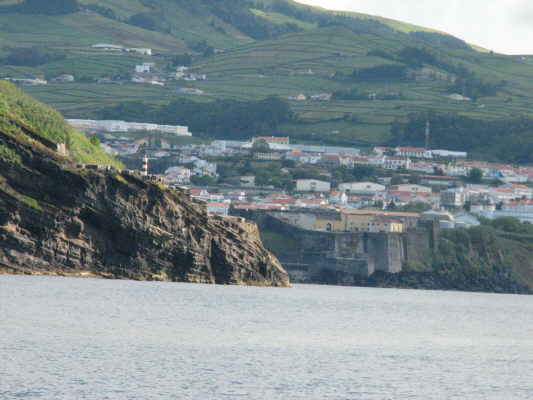 On Faial much of the coastline is steep cliffs with just a little green vegetation and relatively little beach. 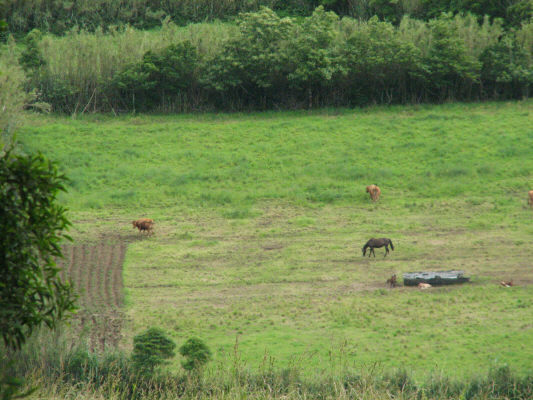 The farming is done on the plateau where collapsed cones have created a rich soil for pastures. Many of the early inhabitants were Flemish farmers who brought their cows with them. The predominant hedgerow plants are bamboo (12-15 feet tall) to form pastureland. 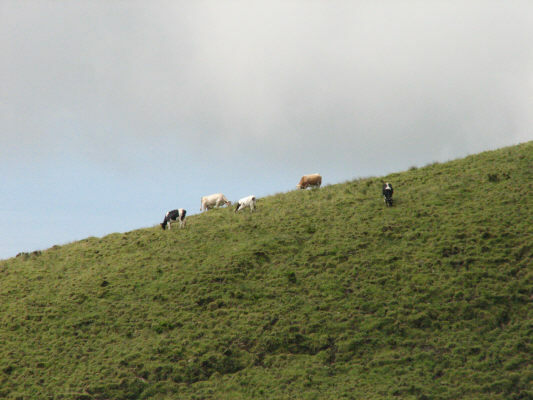 Sometimes cows are tethered within a plot, but higher up the plateau they roam freely on the very steep sides of the craters and cliffs. 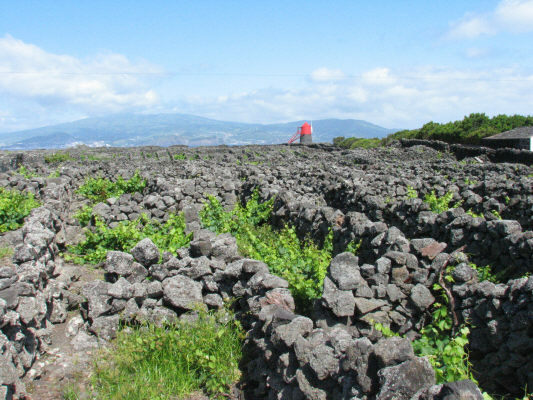 In some areas the pastures are delineated by fences of volcanic rocks. 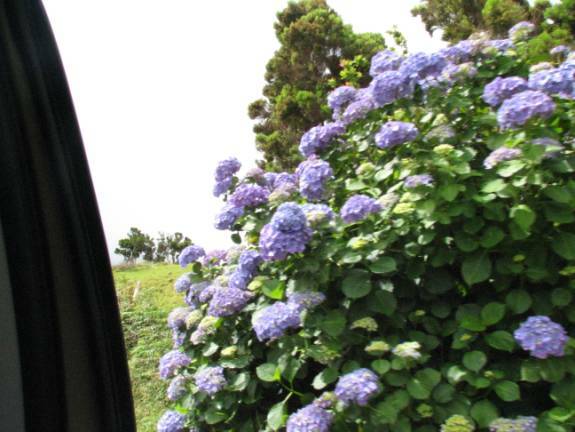 The hedges along the roadway are often wild hydrangeas in colours varying from pale pink to vivid blue / purple. These flowers were introduced from China in the 18th century and have become naturalized. 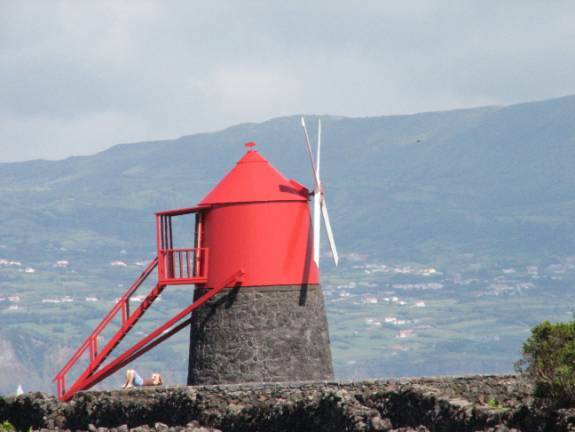 Even though the Azores has traditionally had a high pressure (little wind) area around it in the summer, there is enough air movement from the air heating up over the land (convection) that there are many windmills on the island, both of traditional and modern design. 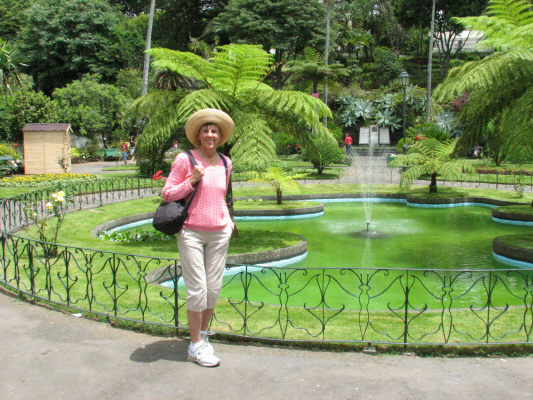 We visited the small Botanical Garden with pathways and pools surrounded by indigenous and naturalized plants, each labeled in Latin and Portuguese. It was easiest for us to identify the plats in the large herb garden. 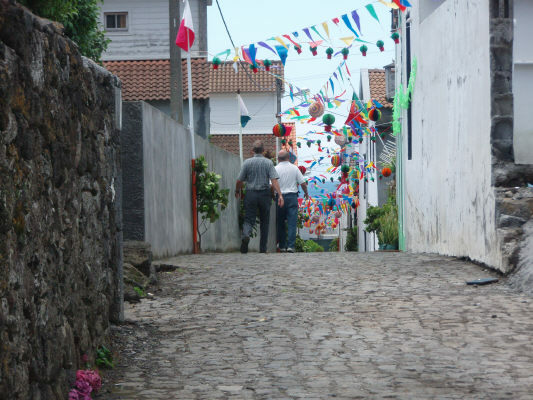 The island is not geared up for tourists except from other Azorean islands and Portugal. 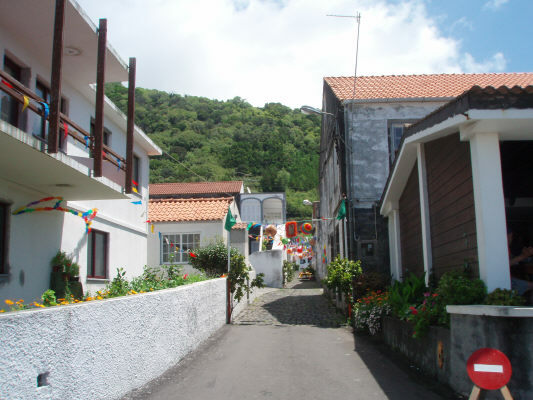 Two of the most spectacular sights on Faial are the Caldeira near the centre of the island and Capelinhos on the northwest coast where a major volcano erupted in 1957. 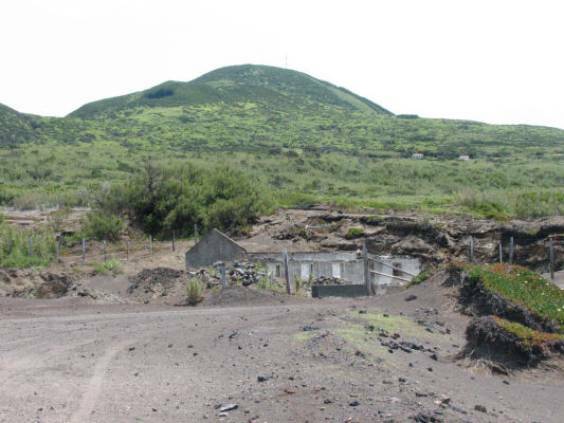 The Caldeira is a crater that experience minor activity at the time of the Capelinhos eruption with steaming fumaroles and the partial draining of the lake that had lain inside. 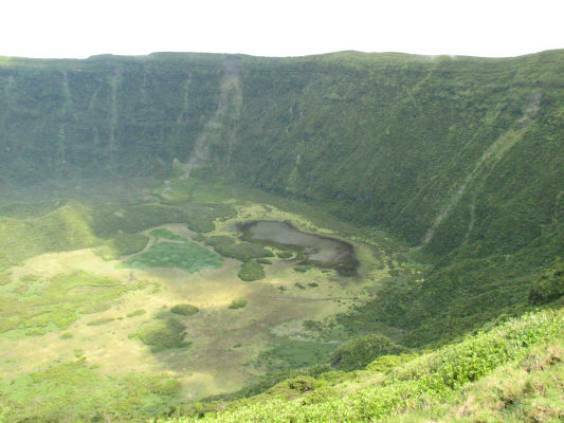 The crater is nearly 2 km in diameter and 400m deep with a very steep interior. Capelinhos is the northwestern tip of Faial and has a lighthouse that used to be on the coastline before the major eruption of a new volcano in 1957 and 1958. The eruption left a new headland 160m in height and added 2.4 square km to the size of the island. About 140 million cubic metres of material was ejected and on one night nearly 2m of ash fell. 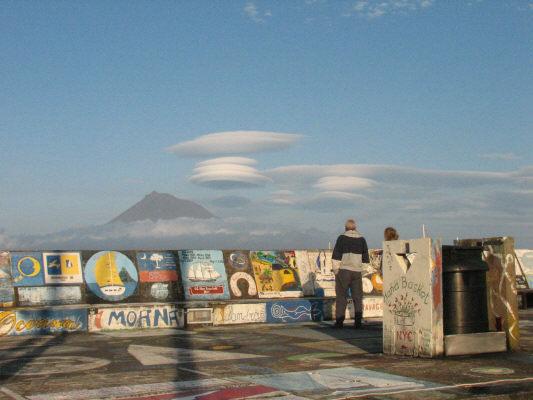 Steam rose at intervals for several years, but none has been seen since 1979 and the volcano is not thought to be extinct. The newly formed cliffs, mostly of loose ash and pumice, have been eroded by winter storms so that today less than 1 square km of the extra area remains above water. Tough grasses are gradually colonizing the almost sterile soil. 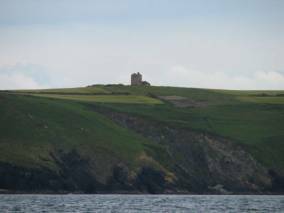 Miraculously, the old lighthouse and its buildings still stand, although they are almost invisible from the sea. At least 300 houses were destroyed by the associated earthquakes or buried by ash. The island’s cattle were moved to Portugal and many women and children were evacuated to the nearby island, Pico. There was also a marked increase in Azorean immigrants to Canada in the late 1950’s. 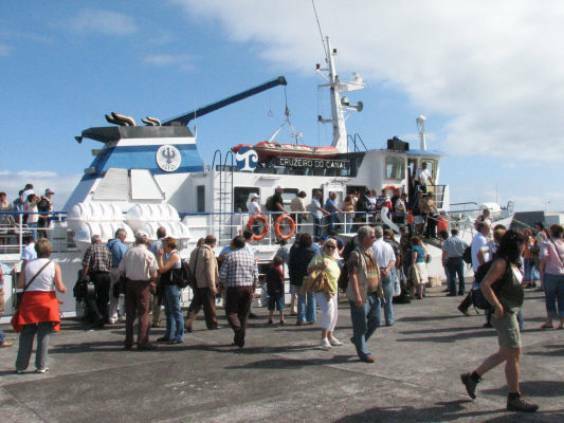 Pico: We took the ferry across the channel to Pico, a 45-minute trip and rented a car to tour this island. 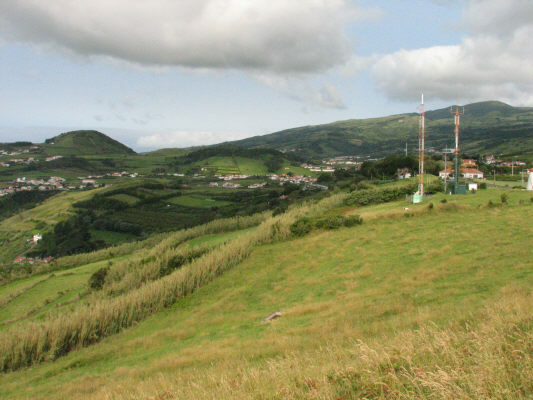 This island is dominated by Pico Alto, the one volcanic peak in the Azores that has not crumbled in on itself. It is 2351 meters tall. 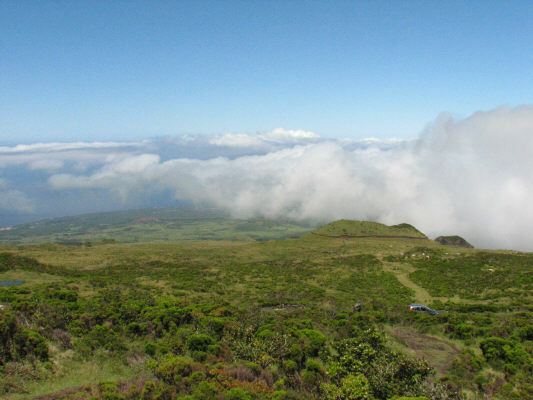 The lower slopes are forested up to about 1500 meters with shrubs reaching up another 500 meters, but the final 300 meters is bare lava and show-covered in the winter. 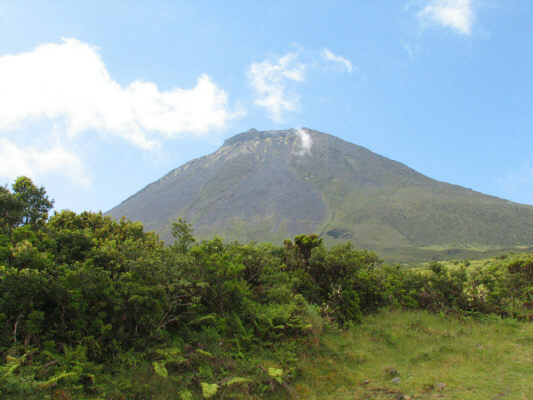 The peak can be climbed, but a guide is recommended because of the 40-degree ascents and loose footing of ash and pumice. 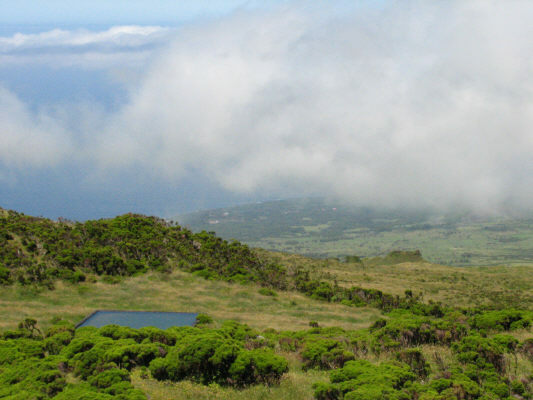 We drove as far as we could but did not venture up to the top to see the 300-meter (in both depth and diameter) crater nor the spectacular views of the nearby islands (Faial and Sãn Jorge). We were fortunate that the cloud cover that normally shrouds the peak lifted for a few hours the day we were on Pico. When we were driving up to the peak, it was much like looking out the window of an airplane and seeing clouds below. Cattle are raised in the higher elevations, but the fences are almost always made from piled-up volcanic rock rather than bamboo. There are also square concrete drinking troughs for the cattle that are filled by rainwater, and look like mirrors imbedded in the mountainside. 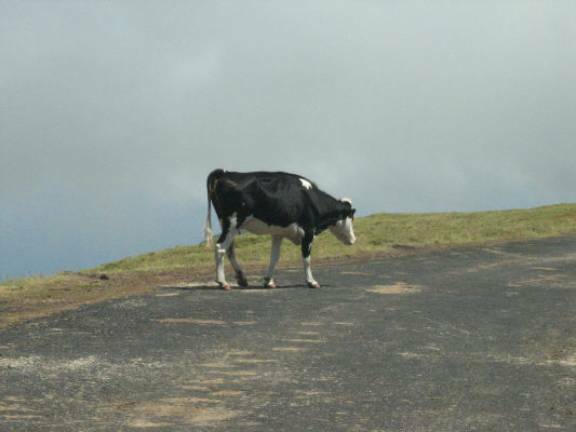 Some cows are pastured, but others wander, sometimes impervious to road traffic. There are two distinctive cheeses produced on Pico: a creamy, white mild cheese and a hard, yellow cheddar-like cheese, both wax-covered. 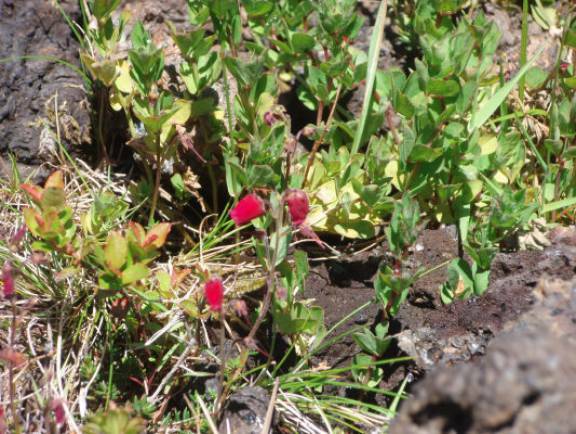 At the high altitudes on both Faial and Pico there are alpine flowers. 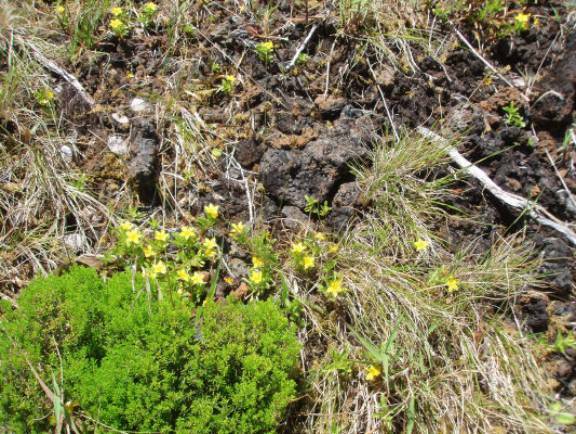 The last time we saw these tiny delicate flowers was on the Slate Islands in Lake Superior. 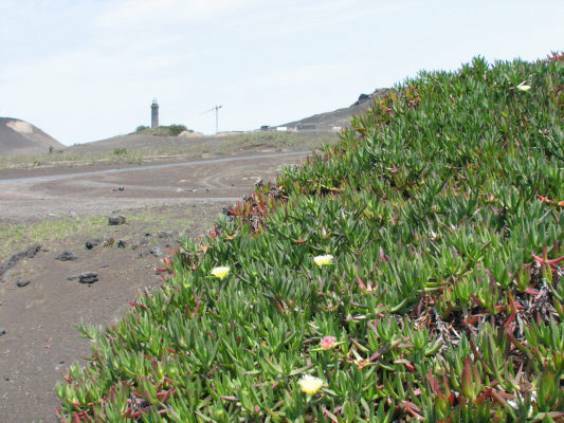 It’s a wonder how the seeds for alpine plants (probably in Europe) got transported to the new volcanic heights in the Azores. 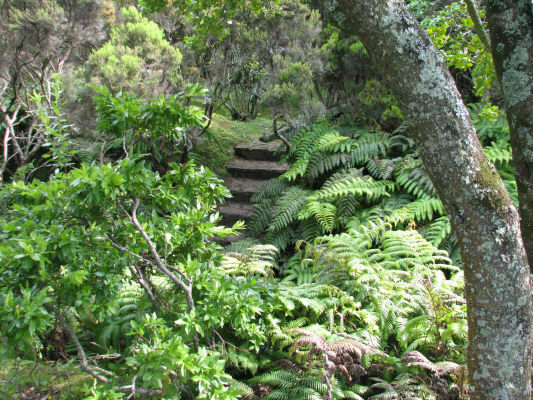 On Pico the coastline has fewer high cliffs and more gardens on the southeast side of the island. 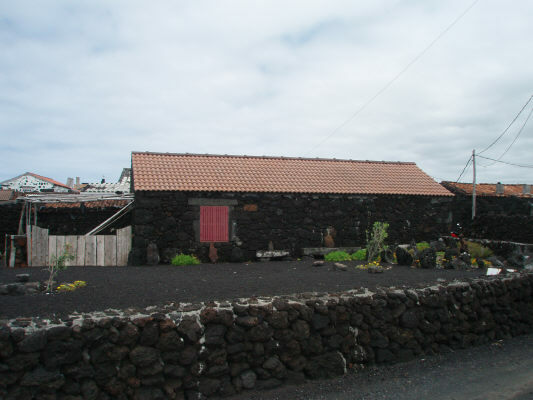 The gardens are very small plots surrounded by lava rock walls about 4-6 feet tall. These fences protect the plants from wind and also keep the soil warm to extend the growing season. 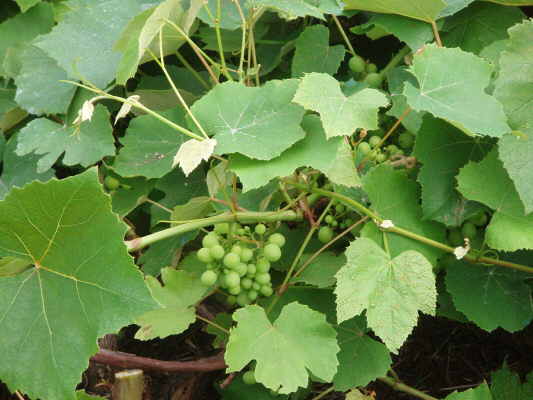 Pico used to have a big wine industry, but the vines were attacked by a disease in the late 19th century. The vines are being replaced by heartier stock, mainly from California, but the comeback is slow. We sampled some of Pico’s red wines and they are drinkable, but not outstanding. 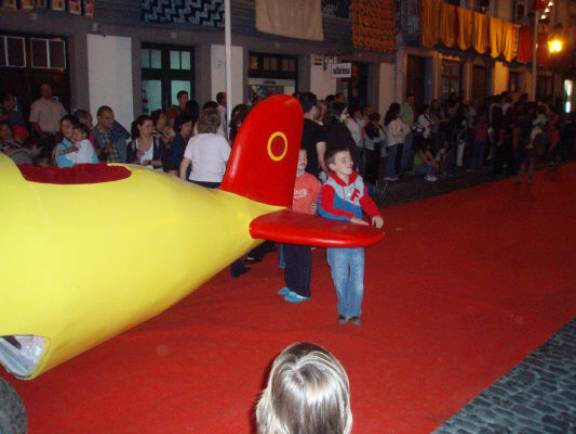 They are exported to other Azorean islands, but not world-wide. In addition to grapes there are orchards of apples, pears, apricots, peaches, plums, oranges and figs. We had lunch in Lajes on the south coast. 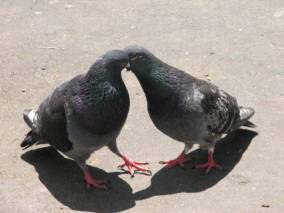 As in most towns, the Roman Catholic church or cathedral dominated the main street. Paper lanterns and banners adorned side streets. Lajes used to be the center for the whaling industry and processed up to 300 carcasses a year until the industry stopped in the 1970’s. Most of the best scrimshaw (ink drawings on whale bone and teeth) is produced on Pico. The north coast is more spectacular with lava arches, stacks and sea coves. Some cliffs are over 400 meters high, and are black, charcoal and dark gray. There is a barren zone where no vegetation grows. 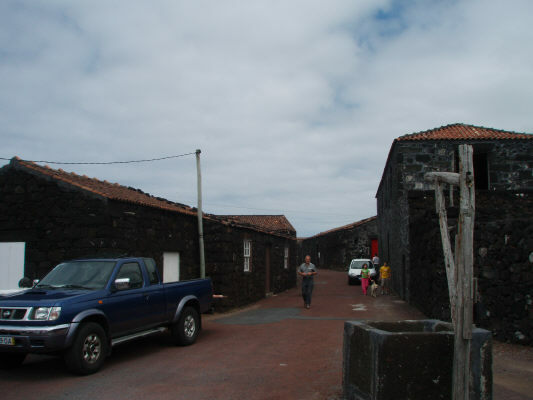 Cachorro is a village along this coastline that is stark with its dark rock roads, black houses with red tile roofs and virtually no vegetation. 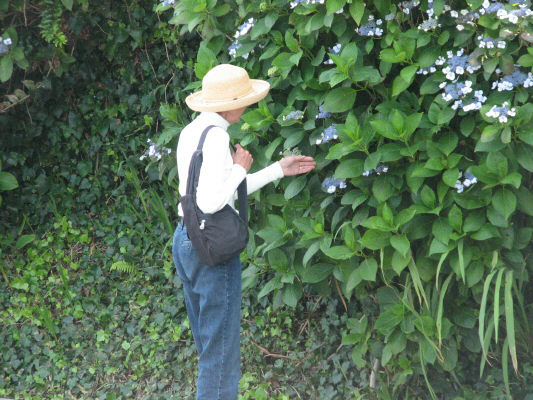 As you move up the hillside inland, the road is banked with hydrangeas, wild roses and yellow ginger lilies. 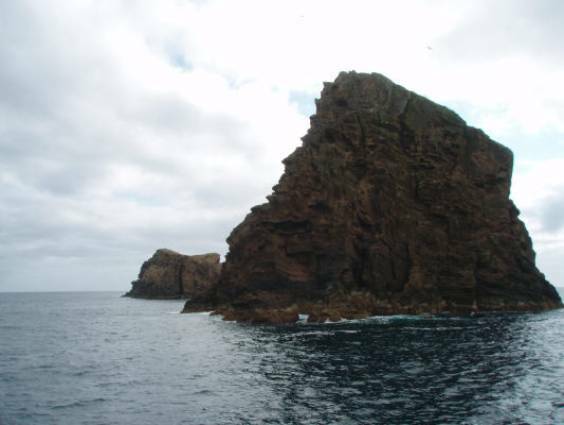 São Jorge: We did not stop at this island, but sailed around it on our way to Terceira. It is a long, narrow island consisting of a string of volcanic peaks, lower to the northwest, reaching their greatest height at 1066 meters. From a distance this island reminds us of the serrated backbone of a sleeping brontosaurus. 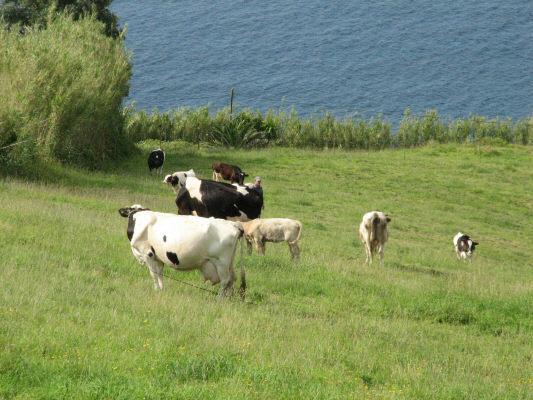 The high land above the steep and rugged coast forms a rolling plateau where cattle graze; São Jorge has its own distinctive cheeses. There are waterfalls along the coastline cliffs that we were unable to see as we transited the area in the evening and at night. 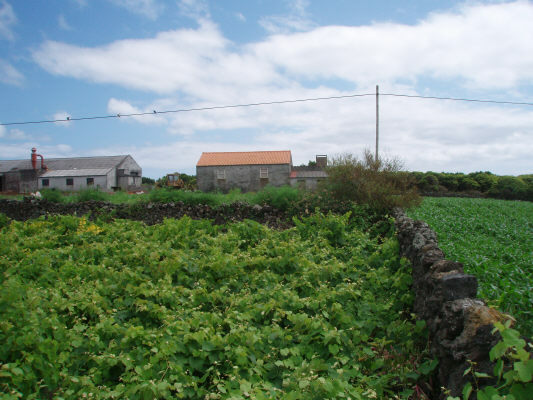 Terceira: We spent our last three days on this lively island. 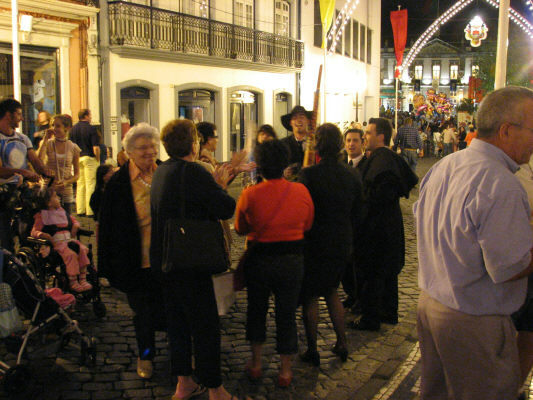 The island was celebrating a 10-day long fiesta in honour of São João (St. John the Baptist). 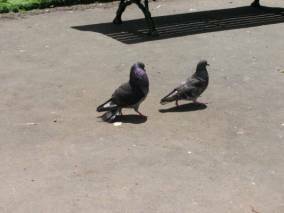 After all, it was the end of June. Monte Brasil on which the Portuguese had constructed a fort guards the entrance to the harbour. 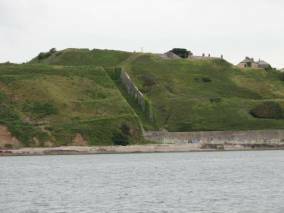 The steep cliffs make it a natural fortification. 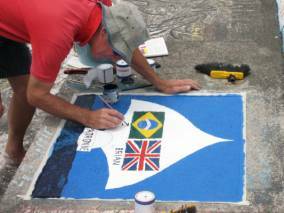 We docked the boat in the modern, new marina in Angra do Heroismo. 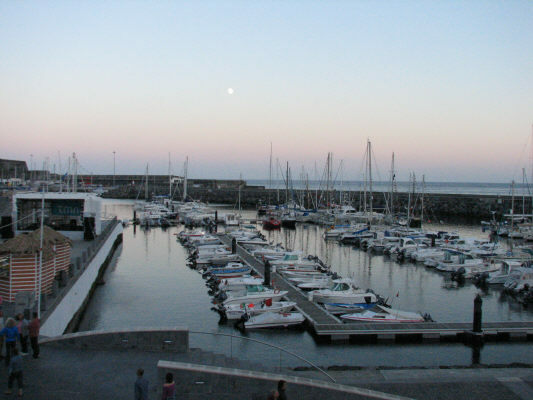 It was less protected from sea surge than the marina in Horta, but was secure enough. 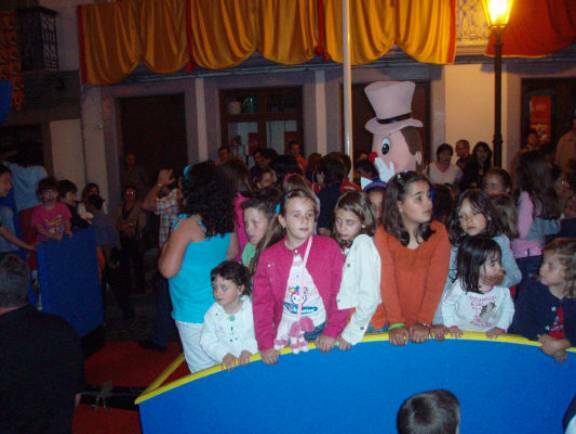 We did not tour the island since the fiesta in town filled our days and nights with activities. 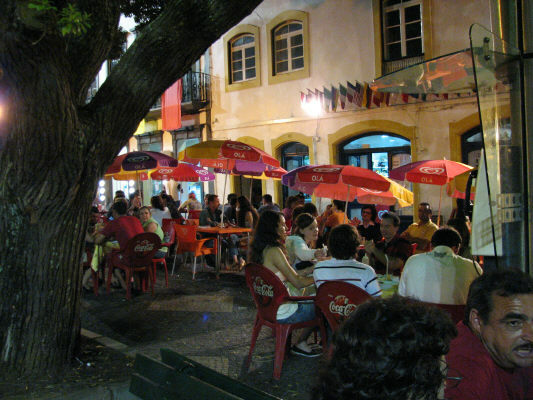 Angra do Heroismo is more cosmopolitan than Horta, especially with the fiesta in full swing, which attracts folks from other islands and Portugal. 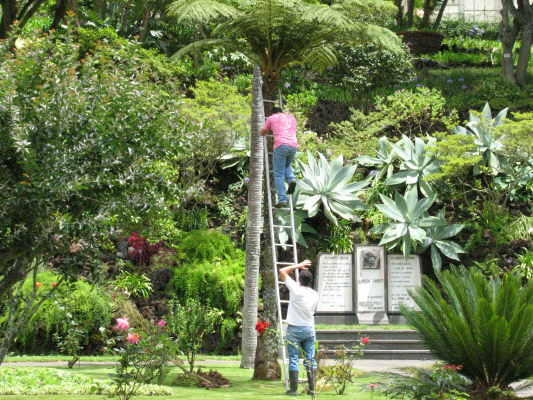 Our first afternoon in Angra do Hemoismo after our overnight sail from Faial we wandered into the public garden, a beautiful well-maintained public space. 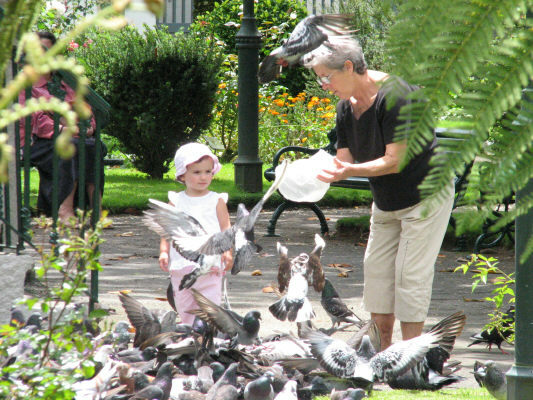 We felt glued to our park bench taking in the sights: large Magnolia trees in bloom (two months behind Charleston), tree ferns and tall palm trees, folks feeding the pigeons corn while school children chased them, the hens intent on getting the corn and the male pigeons showing plumage and intent on the pigeon hens. 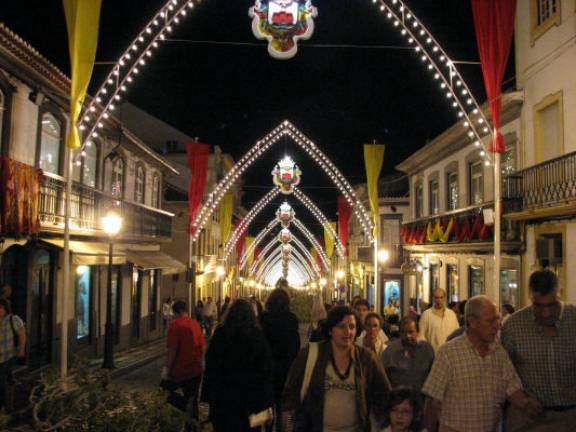 The main streets in the town had archways of lights and paper lanterns and decorations. 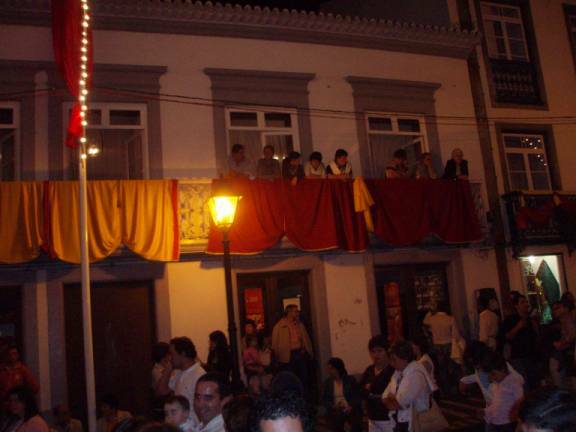 People who lived on the upper floors of the buildings along the main streets had put colourful quilts over their balconies. 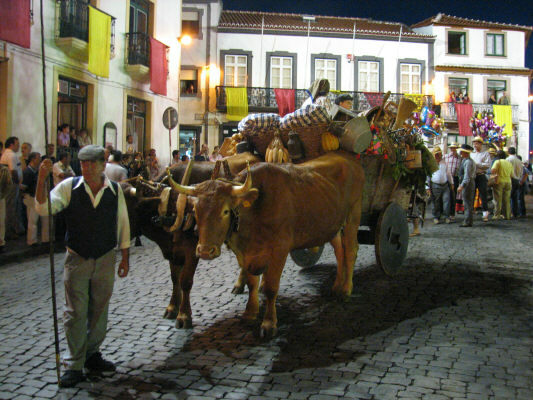 There were parades almost every night; the main streets were carpeted in red (spikes hammered between the cobblestones held the carpet in place). Floats from previous nights’ parades were left abandoned on street corners. 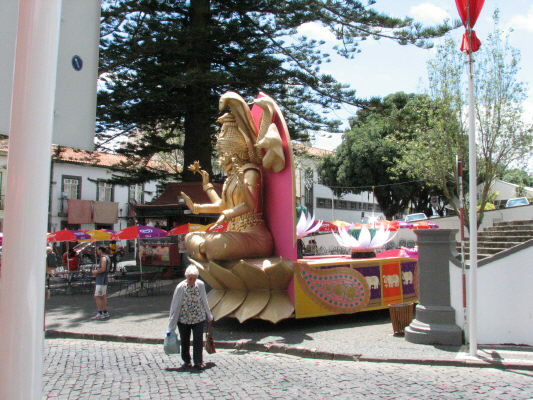 An East Indian temple God(ess) … why in the Azores? There were temporary food stands offering local cuisine, beer stands selling the local brew (about $1./glass and pretty good), and vendors selling a wild Brazilian drink made of limes, sugar, crushed ice and a liquor that was almost 200 proof. These were in addition to the regular restaurants and cafes. There were stages and bandstands at every city square with a band, vocal group, jazz or pop group entertaining, and dancing in the streets until 3:00AM. This was a family affair; children as well as adults enjoyed the festivities well into the wee hours. Each day seemed to have a theme that the parade and street decorations followed. 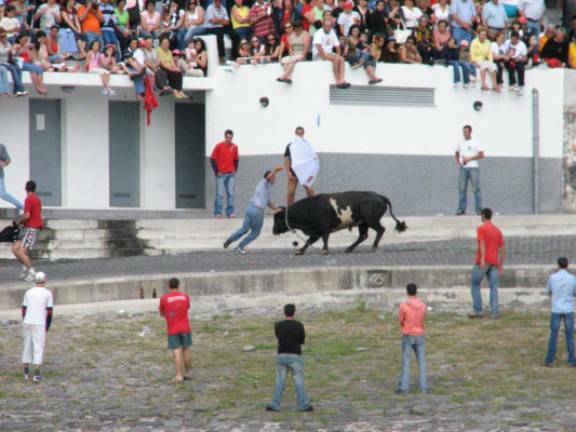 One featured event was the “bull fight.” It was much gentler and tamer than the Spanish bullfight. For one thing, the bull is not killed. He is tethered with about 8 men controlling the beast. 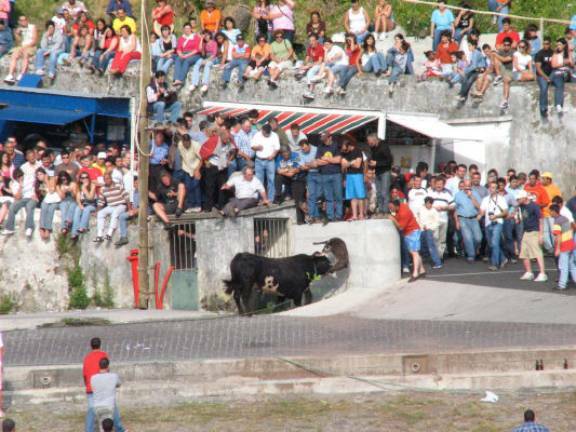 Young men (no women) have umbrellas and colourful scarves and tease the bull into charging them. This event was held on the waterfront, and our deck provided front-row seats for us. 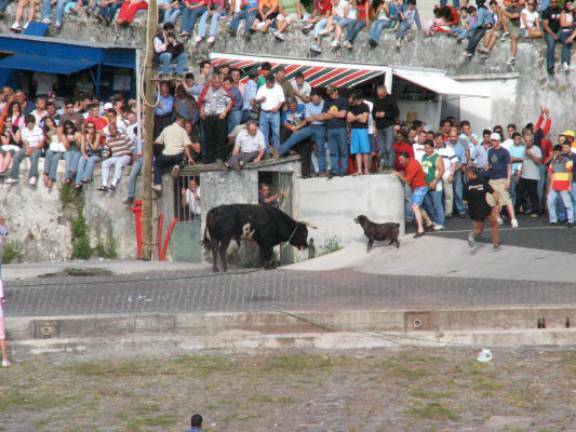 The bull was teased into the water, was fairly benign, and had more fun attacking a dog than the young men. 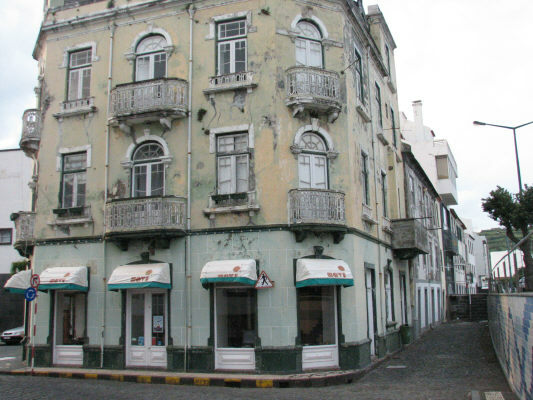 We were waiting in Angra do Heroismo for a weather window for our last major ocean passage to Ireland, about 1120 miles away. A major low-pressure system with very strong winds passed just north of the Azores on Friday, June 29, giving us good winds but large seas for our departure on Saturday, June 30. 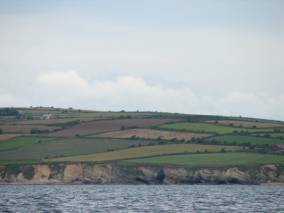 There were five other boats making the passage with us with destinations from Ireland, along the south coast of England and the French coast of the English Channel. 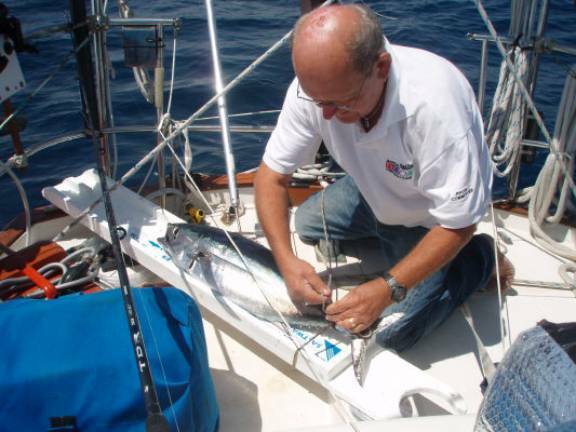 Patronne, Sarah Grace and Calalou had been part of the Bermuda to Azores rally. Baal, a sloop from Hamburg, Germany and Avon Grace, a single-handed sloop from England joined us. 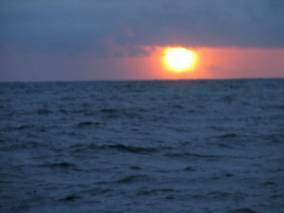 After our first day at sea we were out of visual range of each other, but we spoke over marine single sideband radio every morning and evening to share positions, weather information, and cruising news. The first four days we had good winds and were able to sail. 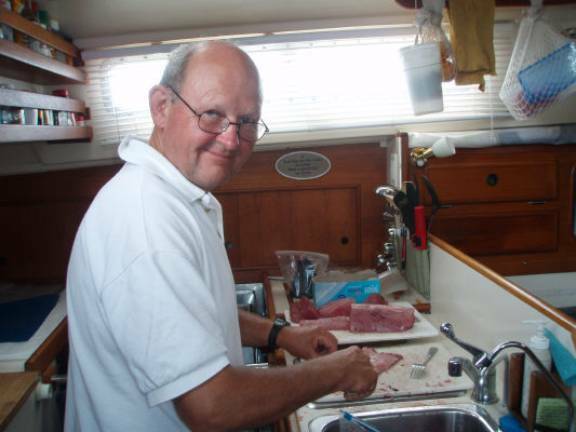 Then we had a few days of on-again, off-again wind when we did a combination of motoring and sailing. 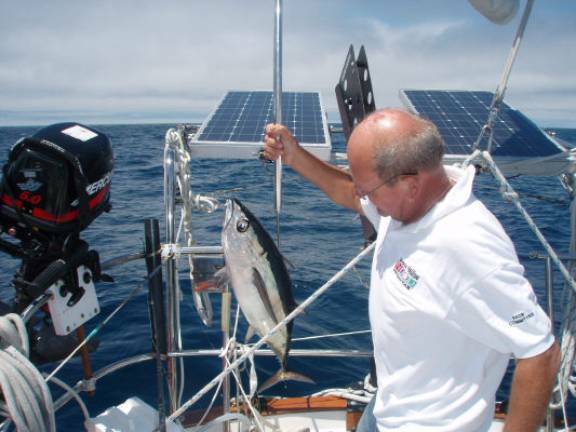 These were our most successful fishing days, catching an 8, 10 and 16 pound Albacore tuna. They are a great sport fish, giving Brian a good fight, and also wonderful eating. 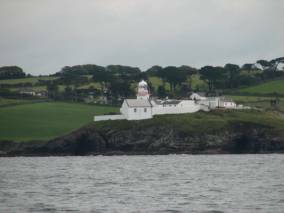 The 1120 miles from Terceira to Crosshaven (Cork), Ireland was the easiest of the three passages across the Atlantic. We followed the Rhumb line (shortest distance between two points) most of the way with winds from the western quadrant. As we approached the Emerald Isle, there were predictions of gale force winds, but we managed to dock at the Royal Cork Yacht Club in calm weather with no rain.